Winter Folk Dance? Try Jingle Bells! 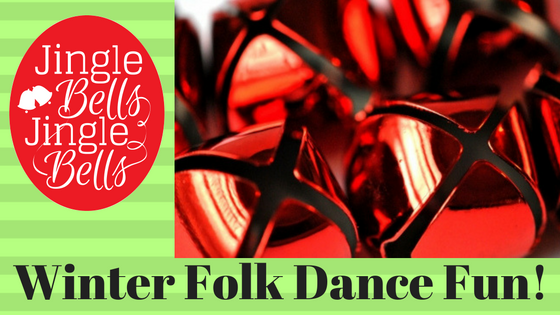 Recently on my Facebook page, I asked folks to comment with their favorite winter folk dances. 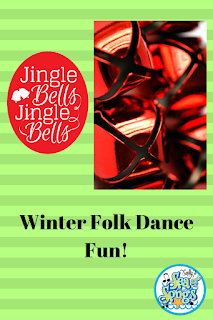 What I discovered was that most of us don't have "official" folk dances that we associate with winter, but rather do lots of freeze dances to holiday music and movement activities to Nutcracker music. One reader mentioned that she used a Jingle Bells dance. Another reader asked for directions, so I thought I would share my version of a Jingle Bells dance here on my blog. The version that I use is a combination of about 3 different versions that were posted on the Music K-8 email list somewhere around 2002 or 2003. 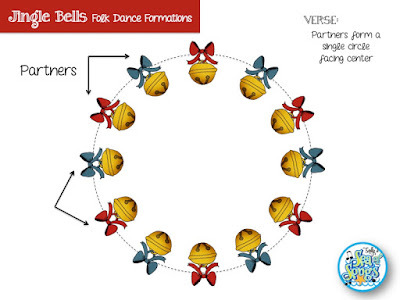 While the dance uses basic folk dance formations and steps, I adapted these to meet the ability level of my youngest students and to work in the time available. You should also feel free to adapt to meet the needs of your "folks." Each person has a partner, and the partners make one single circle (be sure to stand next to your partner). Face the center of the circle to begin. "Dashing through the snow..." sideways gallop to the left 16 beats. 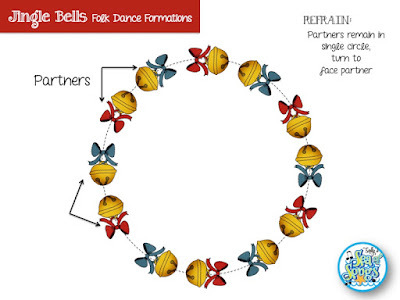 "Bells on bobtail ring..." sideways gallop to the right 15 beats and face your partner on beat 16. "Jingle bells" pat-pat-pat (your knees). "Jingle all the way" pat-clap-clap partner's hands. "Oh what fun it is to ride in a one-horse open sleigh" take partner's elbow and skip around in a circle, end at your own place on the word "sleigh." I discovered this great teaching video by Professor Rob Amchin, which presents a version very similar to the one that I have described. His beginning formation is a double circle, with partners walking side by side. The body percussion during the refrain is in a slightly different pattern. If you students are more familiar with folk dancing, you may want to try the mixer, changing partners at the end of the refrain. Several readers also mentioned the Crazy Frog Jingle Bells dance. If you do not want to do a circle dance with partners, this is a fun line dance, and the video does a great job of teaching the steps. One thing that I love about using Jingle Bells as a folk dance, is that all my students know the song. This means that we can sing to learn the dance, no accompaniment needed. Then, as we add accompaniment music, they will be audiating the song as we dance. 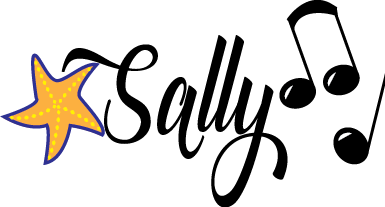 They can sing along, or not, as needed, but the combination of music and movement usually prevents students from shout-singing, as they often do with a song as familiar as Jingle Bells. I hope you will try this with your students! Let me know of your successes and/or variations in the comments! Happy Dancing!